The time has come to choose the region of India, where we want to spend the rest of our amounting six monthly viza… and maybe more…. The choice fell on Auroville, an international city founded by Mother – The Mother – along with Sri Aurobindo. We wondered for some time and we thought it might be something for us. Anyway – it’s worth a try, at least to see. Buy a train ticket from day-to-day in India is not a simple thing … we were able to get a ticket to Bangalore. Night journey in Sleeper Class. Bangalore I remembered as a metropolis. At 3 pm we got a bus to Tiruvannamalai. It was our first experience so long awaited “real India” … because Goa is a little European. This trip was our first “happy bus” with Indian music on full volume, speeding along the road with singing horn, offer delicacies for 10 rupees serving at every stop, and monkeys jumping on the road. We arrived late in the evening and after that the rickshaw drivers took care of us. Immediately we sat in front of the TV in the hotel’s deluxe double, and my father has traditionally slipped on the hunt for the chicken. In the morning my dad as always brought us some rolls and gave us a speech about outside culture world and about him drinking a tea with local people. After that my parents went for a walk when we stayed and watched cartoons. My mom always tells me how much I had missed by staying in hotel instead of going with her explore the world. In the afternoon we went by bus to Pondicherry. The next journey was a little more tiring. In the bus we got stuck through the afternoon traffic jams of the city. In the end, we got off and began searching for the bus that will take us to Auroville. No one knew what we meant … in the end the two rickshaw drivers chose to drive us to the aim. Now we know that Auroville is a little absent on Indian maps of communication – it is situated on the territory of the Indian villages, which you need to ask about when you want to reach there, Moratandi, Edayanchavadi, Kottakarai, Kuilapalayam, Irumbai. 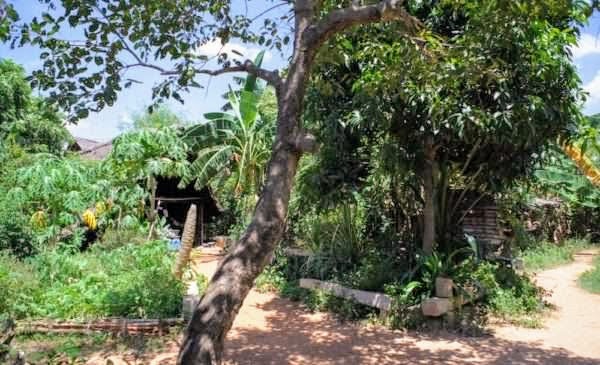 Of the several Auroville units offering us accommodation and basic information necessary to us to discern here the choice fell on Sadhana Forest. Without consultation with the family, my mom chose what she was most into: ecological experiment in the middle of the forest.We were quiet shocked that we will live among the trees in the house made of wood. And here we are in Sadhana Forest, Already three days – without chicken, without coffee, without normal toilets… Instead we have forest silence, interesting International Society, morning gymnastics and night society of mosquitoes.